Mobile game that much awaited by fans, Alto's Odyssey has actually launched in the Apple App Store since last February, but not so for the Google Play Store. Noodlecake Studios Inc This gamers game designed the Odyssey series by taking everything that many people love from the first game, including: beautiful graphics, beautiful atmosphere, and exciting gameplay, sero Alto's Odyssey is updated in terms of stories and beautiful surroundings and more diverse for you excavate without stopping. Alto's Adventure is one of the best free games ever released for Android. 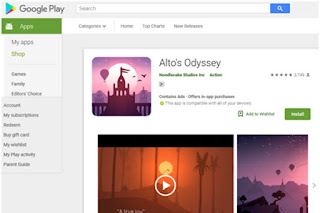 If you have not played Alto's Adventure yet, download it on the Play Store now and play, downloading the latest version of Alto's Odyssey too. Have a nice play. 0 Response to "This Fun Game Finally Arrives to Android Users"